Hi buddy's, It's been a While since we publish a new Blogger theme. After Publishing Minimum a Responsive Blogger template we didn't publish any new theme. OK, Lets come to the point. 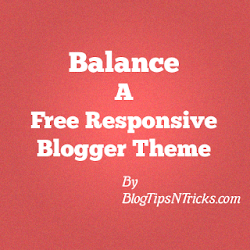 Now We are happy to publish another WordPress converted Blogger theme, Balance A responsive blogger template. you can find three results from searching Because there are three subscribe widget. The username for your feed can be found at the end of your feed URL.For example our feedburner URL is http://feeds.feedburner.com/chandeepsblogtips , with chandeepsblogtips as the username. On that demo templates, you mentioning that we can edit the comment. is that true or i'm make a missunderstanding? Hi, I just checked your blog I can't see any gaps in-between the post. Can you explain a little. please try to fix your template's footer . it doesn't work properly. some widget doesn't work for the problem of footer. in browser chrome it work properly but in other browser , the footer doesn't work properly , thank you. I just checked it works fine. Nice Template :) how i can hide the images in home page and show it in the posts pages ? This will be another addition to my responsive templates collection. Thanks Bro,. Hi, I just placed the Balance theme on my website, http://www.jackiecapersbrownblog.com and the individual helping me with this is unable to move the Google ad that is between my posts. Can you let me know what needs to be done to correct this? Also, do you know how I can go about getting the slideshow plug in for this theme? Is it possible on Blogger or that is just for Word Press? Seems you've removed the credit links in the attribution, you're not supposed to removed the credits. So, kindly add it back or change to another theme. Thank you for a great theme Chandeep! I love genesis framework and now it's here in Blogspot. Thanks for you reply Chandeep. I've already added the given code but somehow it's still the same. I wonder when I inspect the code, it doesn't use .post-breadcrumbs, but .breadcrumbs. I've been trying to find the solution but not yet so far..
Just send me a copy of the template. :) I'll fix it. It's just perfect, but is it possible to disable the newsletter field on the top? Thanks. Could you tell me how to put make google ads space on this theme? Nice theme thanks, we are using it on our blog here: http://thestylemagnate.sizemikk.com. The main issue we have is its handling of images on the home page. Your theme by default stretches to fit the space which generally doesn't work well and distorts them. We modified it to just a fixed height (I think) but still not a good solution. Any suggestions? this will not index the blog in Google ???? Yeah, but you have to note the previous line of the code. This code is indeed used to not index the blog but hear I used this code to hide the archive pages in Google to improve the SEO. ^_^ It does not affect the blog indexing. We don't need to index the archive pages. How do we add sharing buttons in this template ? let me know, where you want to add share button? To add it after post titles search for the following code. Now Add the share Button code before the above link and save your template. bro awesome is small a word for your this template and thank you is small a word for your work. Thanks bro, Glad you liked it. Where do you want to show the ads? Sorry bro, we can't show ads near the header. To show ads in sidebar you can use the template layout page. Please try again. If the problem occur again, kindly contact me with a screenshot of the error message. When I upload the the Balance theme there isn't the opt-in email form at the top and I don't know how to add it. Can you give me the page link where you found the error. i like this template so much. but, where is the search button?